The original web version of this report contained an error in the Nigeria country profile—Under "Work Injury," informal-sector workers were originally listed as "covered," but were not. In addition, self-employed persons should not have been listed under exclusions. The correct information now appears in the web version of this report. In the Central African Republic country profile—Under "Old Age, Disability, and Survivors," "Source of Funds," the "minimum" monthly earnings under "Insured person" and "Employer" sections should have said "maximum." In the Equatorial Guinea country profile—Under "Unemployment," the year of the law and its severance pay provisions were incorrect. In the Mali country profile—Under "Work Injury," "Survivor Benefits," the legal annual minimum wage in the "Funeral grant" section originally was listed as 420,000 CFA francs, but should have been 480,000. The correct information now appears in the web version of this report. 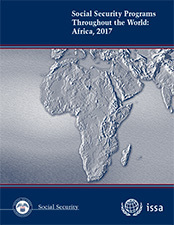 This third issue in the current four-volume series of Social Security Programs Throughout the World reports on the countries of Africa. The combined findings of this series, which also includes volumes on Europe, Asia and the Pacific, and the Americas, are published at six-month intervals over a two-year period. Each volume highlights features of social security programs in the particular region. Social Security Programs Throughout the World is the product of a cooperative effort between the Social Security Administration (SSA) and the International Social Security Association (ISSA). The ISSA is the principal international institution bringing together social security agencies and organizations around the world. Founded in 1927, the ISSA is located at the International Labour Office in Geneva. Previous editions of this report, which date back to 1937, were issued as one volume and were prepared by SSA staff. ISSA has researched and written the publication since the introduction of the four-volume format in 2002, and beginning with the volume on the Americas 2015, the publication is co-financed by both institutions. The ISSA has conducted the research largely through its numerous country-based correspondents, as well as its social security databases and other types of data that are drawn together to update this report. Social Security Programs Throughout the World is based on legislation in effect in January 2017, or the last date for which information has been received by SSA or ISSA. We added a new country, Mozambique, to this volume. Megan Gerecke and Harald Braumann managed the data collection and analysis for the ISSA, and John Jankowski and Ben Danforth performed a technical review of the report for SSA. Staff of the Office of Information Resources at SSA edited the report and prepared it for publication.